John Dwyer is a member of the great Dwyer family from Cork. In 2010 John was named joint TG4 Traditional Composer of the Year with his brother Finbarr. This award has given John a new lease of life since his retirement from An Garda Síochána and he now regularly travels the country performing in concerts and sessions with younger musicians who revere his music, including Lia Byrne, Siobhán Peoples and Edel Fox. John’s reputation has now extended to music academia with Lia Byrne currently preparing a thesis about his compositions through Maynooth University. His most famous tune is perhaps the reel known simply as John Dwyer's. Confusingly the well known jig Finbarr Dywer's Favourite is also one of John's compositions, as is Caha Mountains which has been called Finbarr Dwyer's! The following biographical information comes from a newspaper report in the New Ross Srandard. From an incredible musical dynasty, John Dwyer is a remarkably talented musician whose creativity has extended into composing tunes that are melodically rich, widely played and highly regarded among musicians. 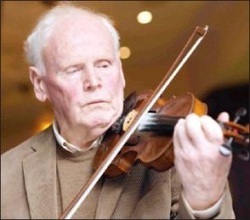 His father played the fiddle similar in style to the east Galway fiddler Paddy Kelly, and both parents played the accordion. John started the fiddle at the tender age of 11. When he joined An Garda Síochána in 1955, he moved to Dublin and got involved in the Church Street and Pipers' Clubs where he met and was influenced by George Rawley, John Kelly, Tommy Potts, Sonny Brogan, Bill Harte, John Clarke and Jack Derwin. He was a member of the Shannonside Céilí Band from the late 1950s and in the early 1970s until 1974 in the renowned Castle Céilí Band. A beautiful and soulful musician, John has composed a number of distinctive and enduring tunes, including 'The Fall of Dunloy', 'John Dwyer's Reel' and 'The Catha Mountains', which are an important addition to the traditional repertoire. In many cases John's compositions have been absorbed so seamlessly into the traditional repertoire that musicians are often unaware that they are his compositions and have been composed relatively recently – the ultimate seal of approval for any composer in the traditional music idiom.